This collection succeeded, it has been delivered on the 08/02/2019, discover the delivery pictures. Ne laissons pas 230 chiens mourir de faim ! 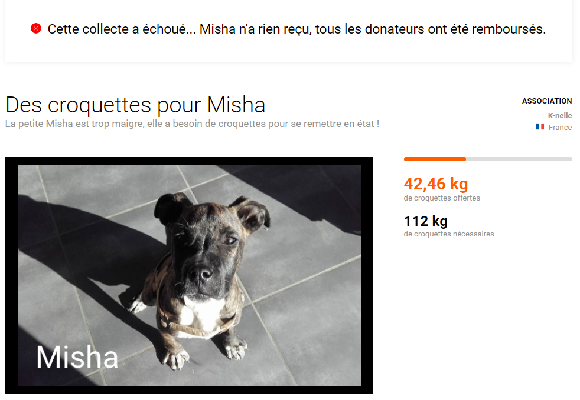 Les 230 chiens du refuge n'auront bientôt plus rien à manger ! Since January 28th, the 230 dogs of Zoritza's shelter in Serbia have been rationed, they are hungry! Worst of all, they will have nothing left to eat by the end of the week ! We want to send 3,000 kg of dry food as an emergency, to help the dogs face the next few weeks. 1. Zoritza ran out of food on January 28th : her 230 dogs only survive thanks to a few bags bought in a hurry ! On January 25th, Andrea, the shelter's only volunteer, sent us this picture showing the food reserve : enough for 3 days only. Zoritza managed to get a few bags from her own money, but they will be over by the end of the week ! As we are writing this text, the reserve of food at the Serbian shelter Azil Bella has been over for several days. The shelter now faces an absolute emergency situation ! With neither dog food nor anything left to cook for her dogs, Zoritza's last option was to buy food with her own money. "I usually use around 100kg everyday. Now, I only give them 60kg to make the food last longer, but they are hungry. I can't stand this situation, I am very worried..." said Zoritza over our last phone call. In early January 2019, the Mukitza association came to the shelter, to repatriate a few dogs for adoption. She brought some food to Zoritza in the meantime, but there is nothing left of it by now ! The shelter Azil Bella is greatly supported by the French association Mukitza : among other things, Mukitza has been employing someone to help Zoritza on a daily basis for the past few months. But today, the volunteers of this friendly association are left helpless: they do not have enough resources to help the shelter in a sustainable way. "All we can do is get enough to buy a few hundred kilos again, but it is far from enough. We will only postpone the disaster for the few days..." according to Céline, the point of contact for Azil Bella within Mukitza. We are able to take action, we have already booked a truck and pallets, but we have to pay our transporter before February 7th. If the collection fails, we will refund all donors. 5. Snow is everywhere : dogs are burning even more energy than usual ! Erik-Bobi grew up at the shelter with his brother and sister Wendy and Kyle. Zoritza fed them with a bottle to save them.... The other siblings have already been adopted in France, but Erik-Bobi is still there. Thrown from a moving car 4 months ago with her sister Zoe, Franny had the chance to survive the fall and be saved by Zoritza... At 8 months old, she is about to live her first winter in Serbia... with an empty stomach! Negative temperatures make things very difficult for Zoritza and her employee at the shelter : in addition to their usual workload, including cleaning, feeding and caring for 230 dogs, they must ensure water remains accessible for everyone. To allow this, the water must be heated right before filling the bowls, and ice needs to be broken at least once a day. A few weeks ago, when the first extreme temperatures came by, the pipe used to bring water in the shelter froze and broke. For several days, Zoritza had to find other ways to prevent dogs from thirst, while taking actions and raising funds to repair the pipe. There is absolutly nothing set up as we write this text : we are their one and only hope ! 10. At 70 years old, Zoritza is getting tired and needs us more than ever ! The situation of street dogs in Serbia was so bad that Zoritza decided to act for them. Her shelter, Azil Bella, was created 16 years ago, and saved hundreds of dogs. Zoritza is over 70 years old now, she spends 365 days a year among her dogs, and shares every minute she has with them. Holidays are not an option, and she never allows herself to stay far from the shelter, even while she is sick. For more than 6 years, she lived there without running water or electricity. She invested all her savings, her energy, her health, her personal life into maintaining this place in a respectable state and making it evolve as best as possible... Everything depends on her... but she is constantly living with the worry of knowing how she will manage to feed her dogs, and she is exhausted. We cannot let her down while she needs us so much ! 11. What will the 3000kg of dry food be used for ? If the collection succeeds, the 3000kg collected will be given to the 230 dogs gathered at Azil Bella. - Animal Webaction has been helping more than 750 animal welfare associations over the past 4 years, with more than 1,700 deliveries in 8 countries (see photos). - We make sure to contact each partner association, inquire to ensure its reliability and always ask for supporting documents. ​- Our partner associations only receive physical products, which means we never send money. When you offer 10kg of food, we deliver 10kg of food to the association. - We also deal with transportation ourselves, and make sure all the products collected are properly brought where the association needs them to be, so a quick delivery is guaranteed. - We will notify you by email as soon as the product bought thanks to your donation has been delivered. - We will ask the association to take pictures of the food received, and will send you these pictures. - If you change your mind, we will refund your donation upon request, without charge or proof of any kind. - If unfortunately the collection fails, we will not deliver anything, we will refund you the full amount of your donation. We checked Azil Bella's activity was legally registered. We organized an interview with the association Azil Bella before publishing its collection. The elements mentioned in the collection constitute a factual and objective presentation of Azil Bella's situation. Once the collection succeeded, we won't send money to Azil Bella association, only . If the collection succeeds, we will deliver the collection ourselves to Azil Bella. We will publish the pictures dry food received by Azil Bella. Azil Bella will not receive any of your personal data. Mara vit sur un site accidenté alors qu’elle attend des petits !